Despite breaking a couple of ribs (I tripped while taking out the trash!) and the distractions of Thanksgiving and Halloween, the cabin exterior is progressing pretty well. 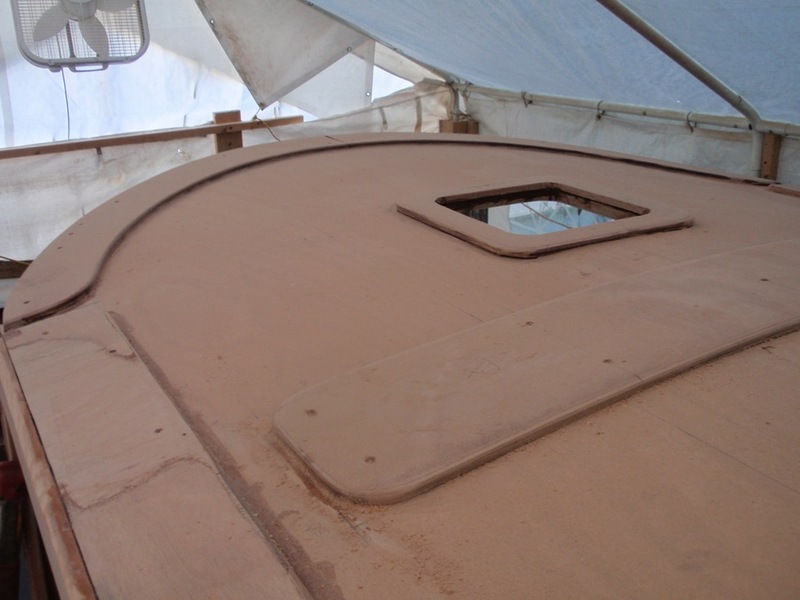 I’m trying to finish the pilothouse top trim and the sliding door frames. I’ve been too sore for a couple of weeks to do any productive work, and it’s driving me crazy. Here’s a mocked-up sliding door in the closed position. When the door is open, the window in the door should line up exactly with the cabin window. I’m going to order the windows soon, from Diamond Sea-Glaze. I’m concerned that the window trim for the 2 windows might interfere with each other so I want the windows in hand before constructing the doors or installing the sliding track. 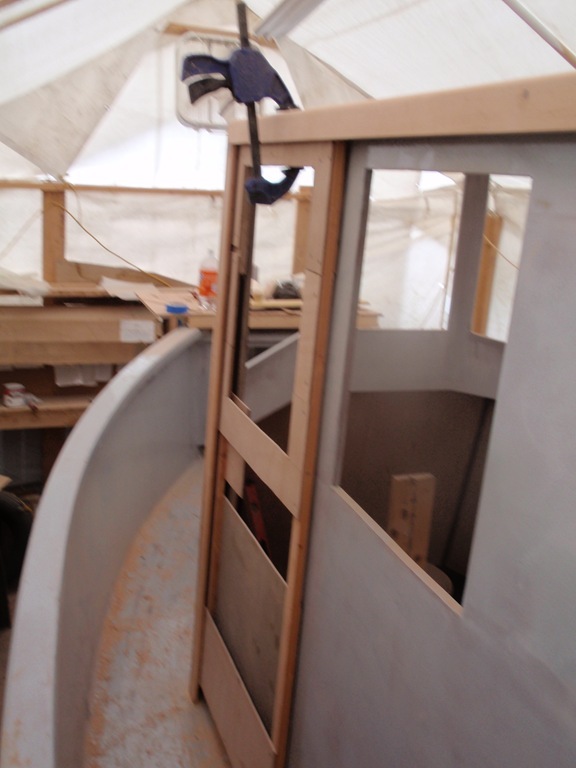 The cabin is mostly glassed and faired. I’ve sanded the hull one more time since I took this picture. It’s approaching the primer stage. The dark lines around each joint inside the cabin roof are from thickened epoxy applied with a caulking gun and smoothed with my finger. It’s a really nice way to make a very smooth, even fillet. Fisheries Supply sells empty caulking tubes. Current launch date estimate: July 4 2009 – a year beyond my initial estimate, and 2 1/2 years total construction time. 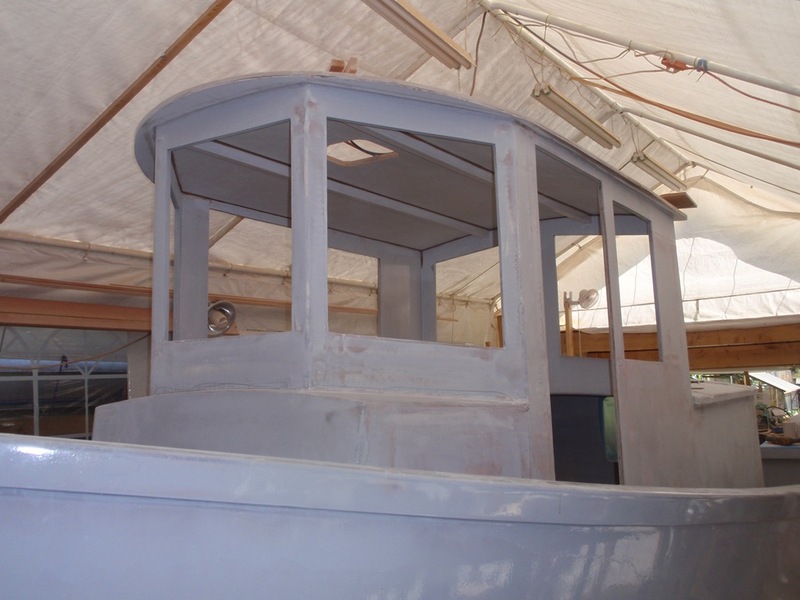 I just looked at my first blog entry, and it’s been exactly 2 years since I started building the boat shed, and just under a year since I flipped the hull and started the interior construction.